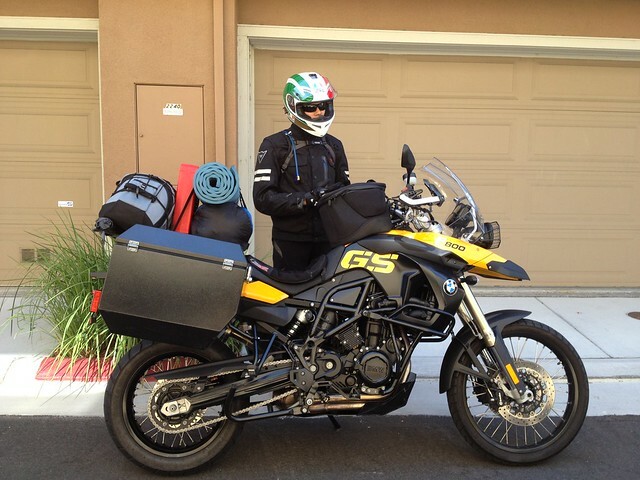 Back in 2012 during the last few weeks of summer I undertook a solo journey of about 4,300 miles on my motorcycle from San Jose, California on the west coast of USA to the state of Connecticut on the east coast of USA. I covered 16 US states in three weeks. This was not my first multi day trip but it was certainly the first multi-week trip and the first without any company. Spending so much time alone whilst in constant motion was a brand new experience and I learned a few things about myself. It was a realization of my dreams for long distance travel and my coming to terms with the reality of travel (at least some aspects of it). It helped me separate wheat from the chaff; break away my media instilled idea of travel from what it is in actuality for me. Sometimes forced and sometimes willingly I sporadically wrote about what I experienced and saw. Here are my notes from the trip juxtaposed with some photos. I had been mentally preparing for this trip for a long time. It was only in the last month leading to the trip that I started to actually prepare for it. 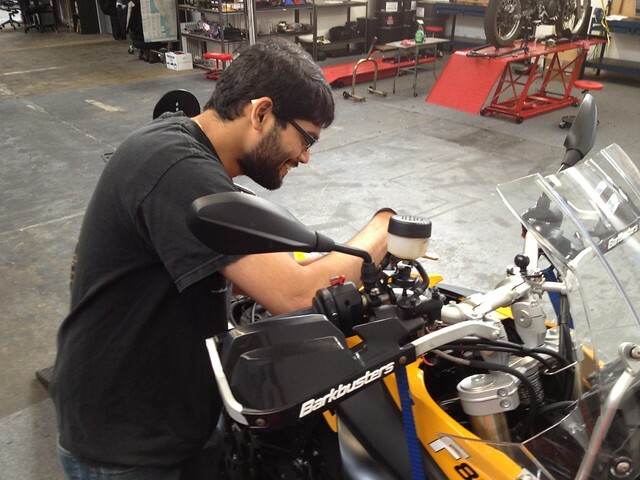 I spent time at MotoShop prepping up the bike and making sure all electricals and fluids are functioning and clear. 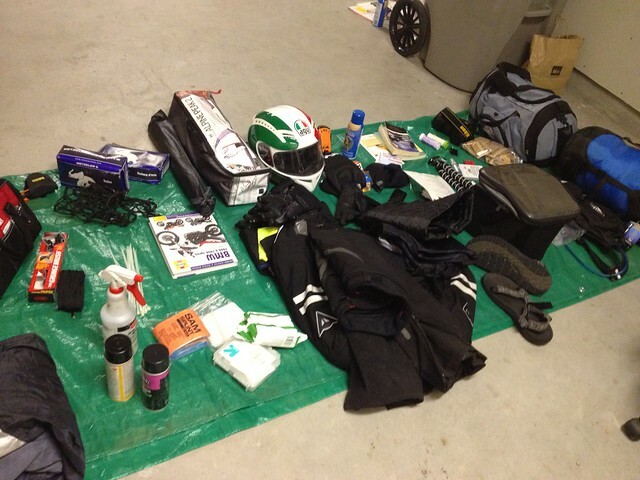 I used up a part of the garage to spread out all the gear I was going to carry with me for the trip. It made planning and packing much easier. In hindsight (of course) I carried more things than I needed and was missing a few important things like a waterproof cover for my sleeping bag. The D-day finally came and I was all set for departure. My first stop today was pre-planned. I had booked a motel room at Barstow. It was almost 11am by the time I left. In spite of the delayed start I decided to stick to my plan and took the scenic route south along CA Hwy 1. I just had to take a photo with the Pacific Ocean marking the start of my journey, after all this was a coast to coast ride. The ride to Barstow was quite harrowing. 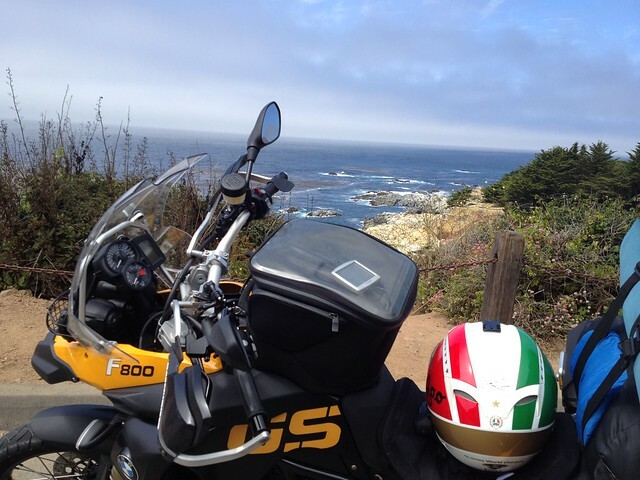 I spent hours riding hundreds of miles of the torturously windy, cliff side highway 1. It was a beautiful route but demanded attention on the road especially since I was riding fast to make it to the motel in time. I cut west after San Luis Obispo and reached Barstow CA at about 9:30pm quite tired. I had decided that I won’t ride in the dark and I did just that on the very first day. I checked in to a Gujurati run motel and reflected on the day. I spent 10 hours on the road today covering around 440 miles. I was drained of energy. Having a fixed, pre-decided upon final destination for the day made the whole journey felt like a race. Today’s goal was to reach Phoenix, Arizona. There was nothing but desert almost all the way from Barstow to Phoenix. The plan was to get there and stay in comfort at a friend’s place. There was a huge storm that flooded the route that I was planning to take. The road north of Joshua Tree National Park was washed out with streams 2 feet deep and 30 feet wide. I had to take an alternate route through Joshua Tree National Park which was now dry after the heavy rains last night. I did run into some sporadic light rain and had to stop to put on my rain gear. 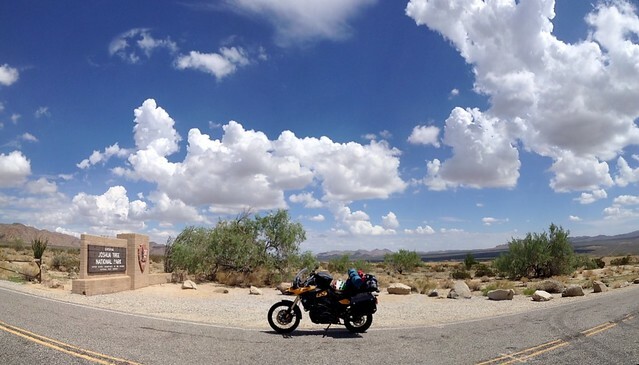 Once through the national park and on the interstate I-10 I was able to ride faster on the straight flat freeway with sights of dark looming clouds, in my rear view mirror, keeping up with me. Funnily enough the clouds stopped following me once I entered Arizona. The speed limit on Arizona freeways is 75mph and I ended up cruising at around 85mph. I reached Phoenix by 8pm. I had covered another 430 miles today. I was going too fast. I spent the next two days in Phoenix with a few friends. The two days of heavy riding gave me some ideas on making the ride more comfortable. Using a PVC pipe, some gorilla tape and zip ties I made a DIY highway peg system to allow me to stretch my cramped legs while riding. 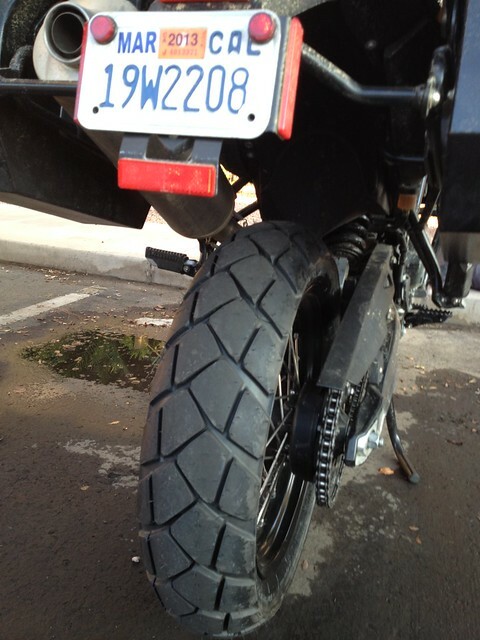 I even got brand new tires for the rest of the trip. The previous set did not inspire confidence when it came to twisties which I would be riding through in the next few days across the Rocky Mountains. 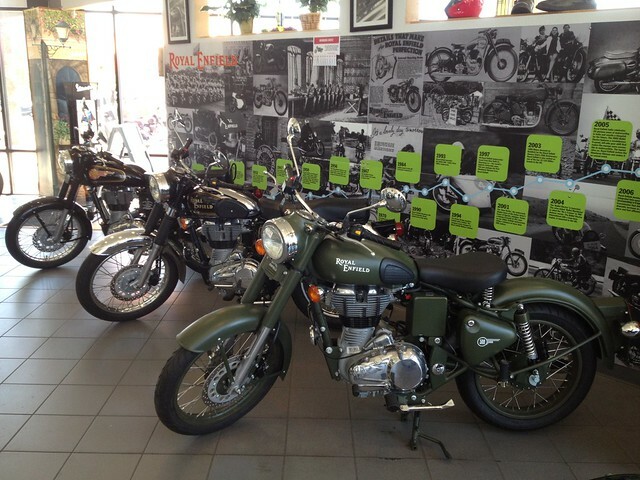 The local BMW motorcycle dealer also sold Royal Enfield motorcycles. It was great to see some Indian presence in a market dominated by Japanese and European vehicles. About to set off on a slow and easy 300 mile day to Gallup, New Mexico through Tonto and Petrified National Parks. Here are some panoramas I took along the way. On the way to Tonto National Forest. Part of the highway ran alongside the rail road and I kept leap frogging this train to get a good photo. I even got a shot of two trains towards each other with a total of seven Union Pacific locomotives. 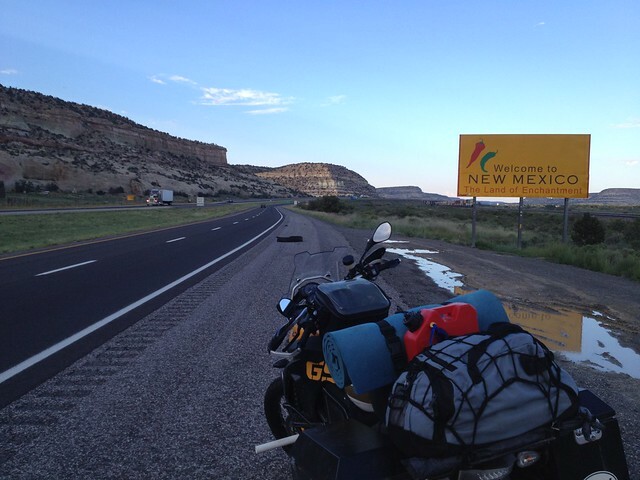 At around 7pm I trotted into Gallup NM and stayed at another Gujju motel at the border of Navajo nation. 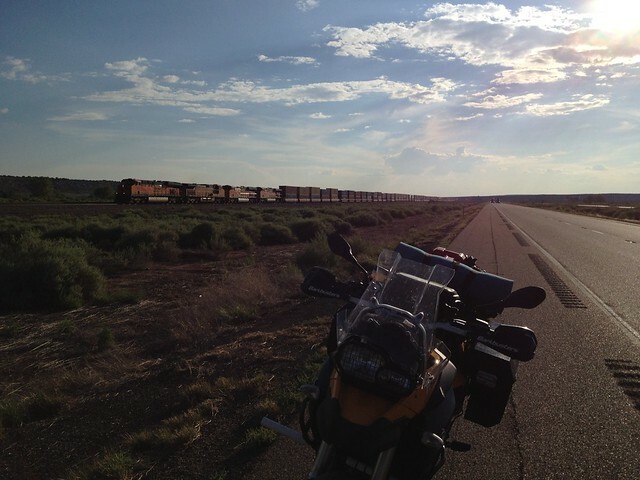 The route today took me back into Arizona from New Mexico. 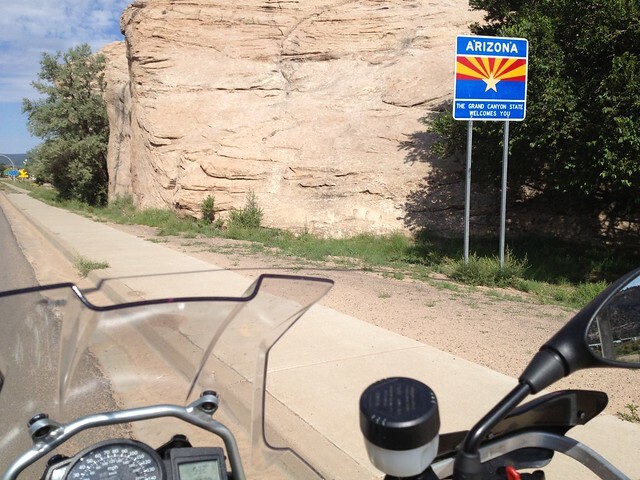 I rode through the Navajo Nation, a semi-autonomous Native American-governed territory covering 27,425 square miles spreading into northeastern Arizona, southeastern Utah, and northwestern New Mexico. 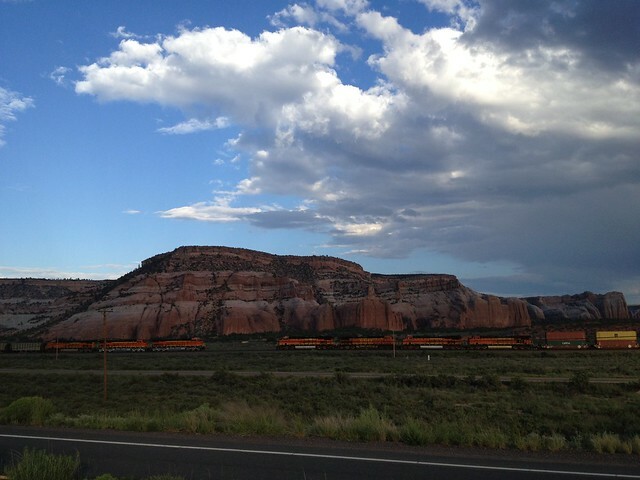 The vast empty lands of the Navajo Nation seem untouched by the American corporate. The only signs of civilization were the fantastic roads, the electric lines and small houses, built in styles typical of developing countries, scattered across the desert like terrain. 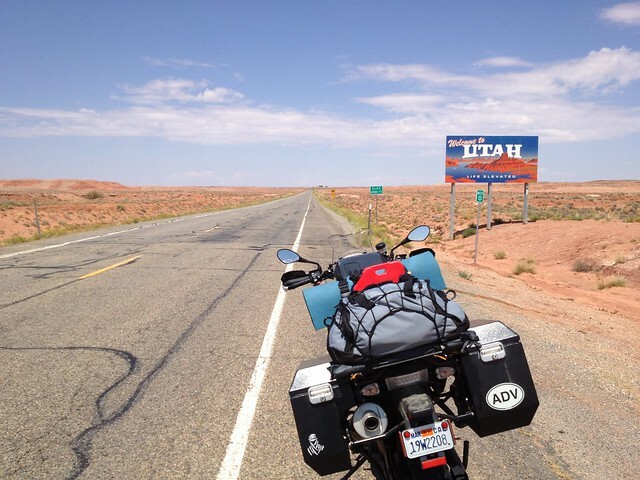 I soon entered Utah and continued into untouched Native American territory. 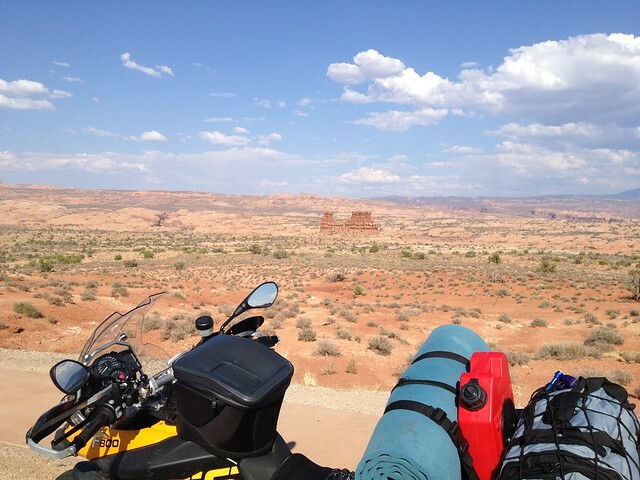 The terrain in Utah was more mountainous than the vast flatlands and canyon lands of Arizona. It was also much redder. As I headed northwards I began to see the natural arch like structures hinting that I was nearing the Arches National Park north of Moab, Utah. 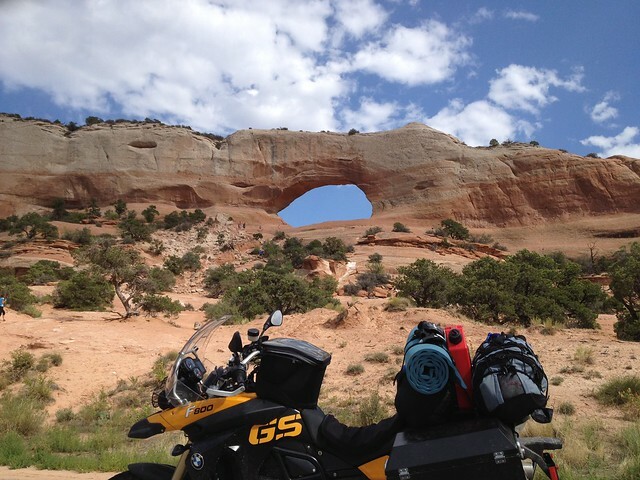 The photo above is of Wilson Arch, the first arch I saw. I didn’t spend much time in the park as once again I had set a destination for the day before I set out and I was under the pressure of making it to Grand Junction in Colorado before dark. The scale of artistic beauty at display was breath-taking and slightly tainted by the throngs of tourists in big air-conditioned buses. I reached Grand Junction, Colorado at around 7pm in fading light and checked into the 3rd Gujju motel in a row. I had covered 350 miles across 4 states today. The Colorado River with the Rockies in the backdrop. I held up traffic on both sides for this shot. I rode a couple of hundreds of miles in great weather. 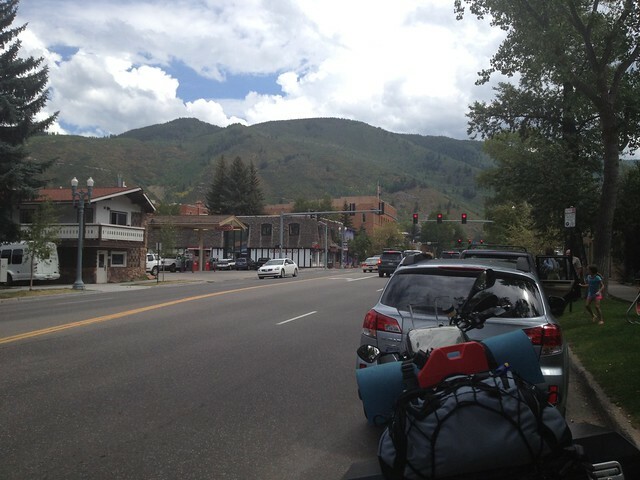 I stopped for lunch at Aspen, Colorado. It’s a beautiful ski resort town with quaint stores. Hunter S Thompson spent his latter years in Aspen. I continued climbing the Rockies amidst splendid views and gained elevation rapidly until I reached Independence Pass at around 12,000 feet. 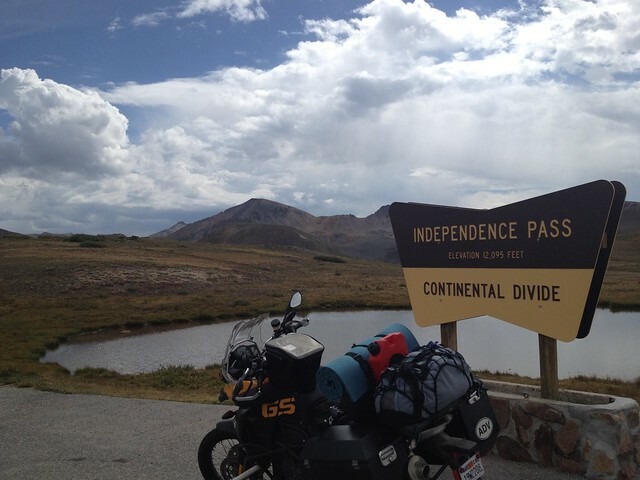 I was now atop the Great Continental Divide of North America. It provided stunning views of the Rocky Mountains. As I made my way down the Independence Pass, the eastern side of the Great Divide I passed small villages with massive stud farms doting the road alongside rolling hills with large mountains behind them. Soon, the weather turned nasty with the temperature dropping to the lower 40s accompanied with thunder storms. Navigating through the Rockies in this rain and low light was challenging. The great clouds made night of the day and the pouring rain wide streams of the highways. Visibility was quite poor with passing cars splashing water on me. Cold and miserably wet I crossed over another pass which was also around 12000 ft high. It was high enough to block out the clouds from rolling into Winter Park which was basking in sunlight completely unaware of the storm on the other side of the mountain. I just couldn’t wait to get dry and warm. By the time I reached my motel around 7:30pm, which was a ski lodge actually, it was closed. I looked around but found no one there to help me. After some more searching I found that they had left my keys taped to the lobby door with a small note telling me to make myself comfortable and apologizing for not being open for me. I think anyone could have stayed the night there if they had spotted those keys. After changing into dry clothes and warming up a bit I went to a bar nearby to have dinner and chatted with an old man at the counter. He was a retired snow emergency medic who has been living in Winter Park for the last 50 years. He excitedly shared some stories of great snow storms and how he loves skiing and thought that Colorado is the best state in USA. He wished me luck on my journey and left me with these words “Life is short, Enjoy every moment, You get what you put in”. Clichéd, but it still rang true. 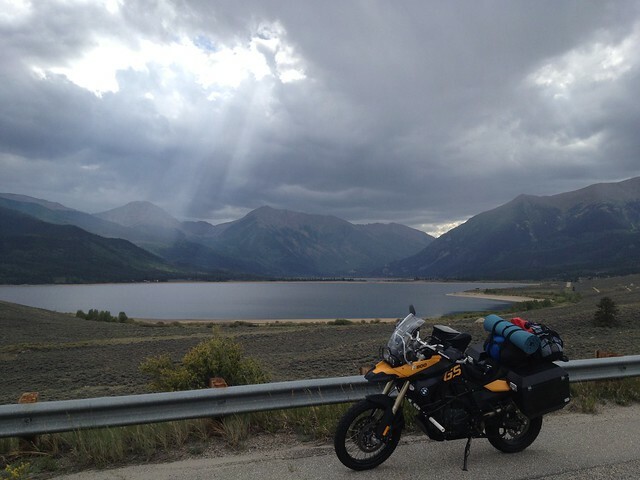 A supposedly relaxed day of riding straight through the Rocky Mountain National Park ended up being an exciting ride to the clouds and then a rush to get away from them. Based on suggestions by locals last night I decided to check out Mt. 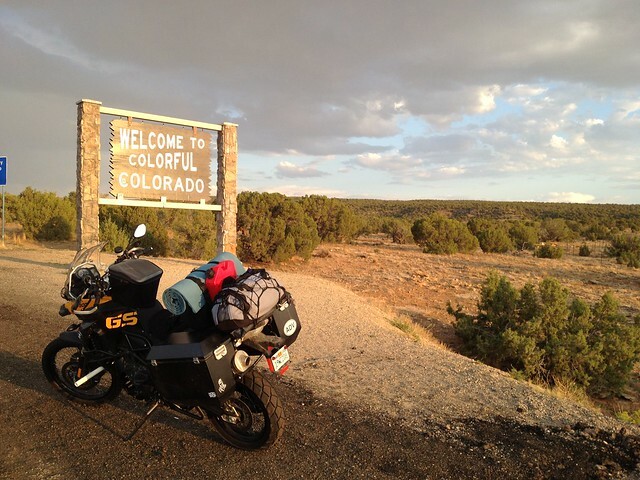 Evans first and then go through the Rocky Mountain National Park to Fort Collins. 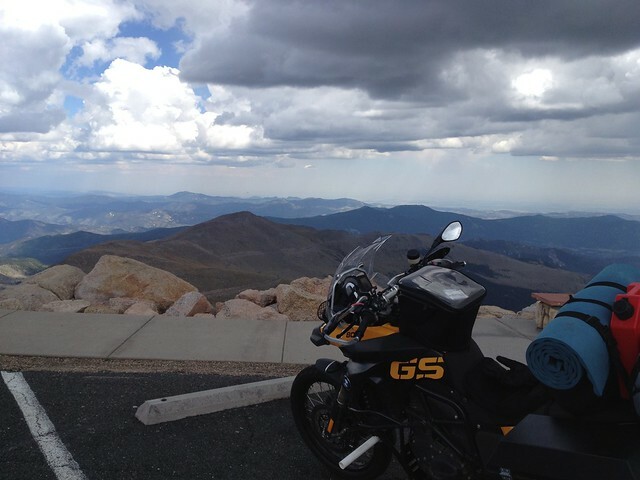 The route to Mt Evans, although short, is slow and gains a lot of elevation. 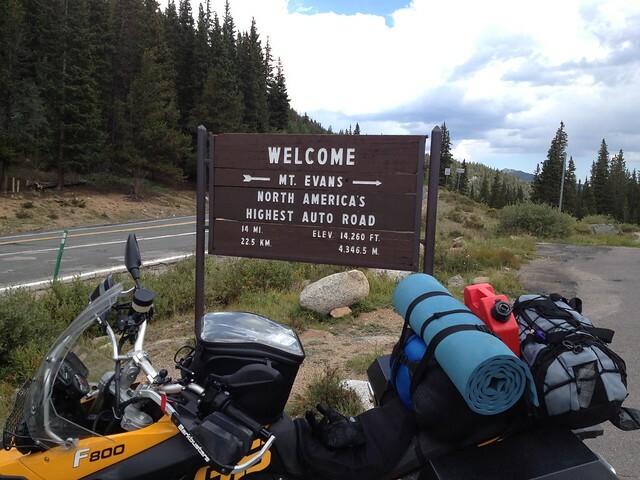 It is after all the highest paved motor able road in north America. The ride to the summit (14,260 ft) was breathtaking as I rode alongside cool and serene lakes mirroring the high mountains and the cloudy sky. There were a few tourists and some of them had stopped to watch the mountain goats graze in their natural habitat. The roads were narrow and curvy. This could be close to riding in the Himalayas I thought. As I approached the summit I could see almost all the tall peaks in the Rockies and soon beyond them to the vast plains stretching from Denver an beyond into Nebraska and Iowa. The weather was great but when I reached the summit I could clearly see a massive storm cloud build up towards the north. A ranger told me that it will soon rain and I, still wary of the rain from yesterday’s ride, decided to leave immediately. The ride back down was quick and unfortunately led me straight underneath the storm cloud. I waited out the heavy rain at a gas station and chatted with a local rider. The rain passed quickly but flew straight towards the Rocky Mountain National Park where I intended to go next. Not wanting to repeat yesterday’s wet ride, after a few calls to a friend for weather forecast, I was on my way out of the Rockies by the interstate towards Boulder, Colorado. The cool and wet mountain clime soon gave way to the hot and dry urban. 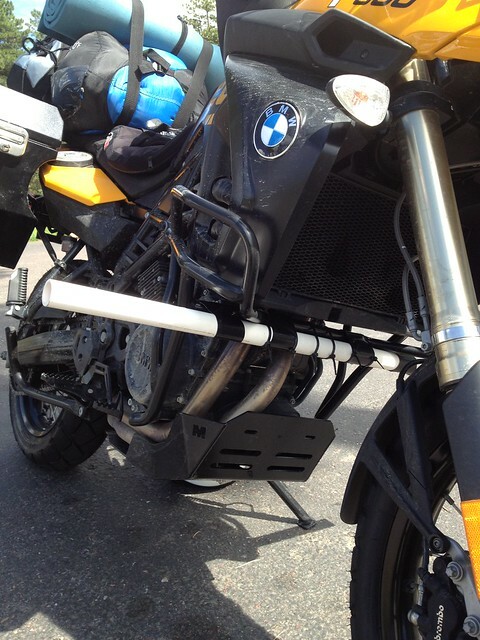 Half way to Boulder I decided to take a 60 mile detour to a recommended BMW dealer in Loveland to get my handle bar wobble looked at and maybe even get in a minor service. Since my tire replacement at Phoenix I was experiencing a slight wobble at the handle bars and I wanted some mechanic to make sure the install was done right. Battling office traffic I soon reached Loveland and was about half a mile away from the dealer when all traffic halted. I waited patiently for 15 mins before I got off the bike to talk to people ahead of me. Apparently Barack Obama had just landed at the Loveland airport and the police had blocked all roads to let him pass. 10 more minutes later after Obama went on his merry way through a crowd of locals holding anti Obama banners I got to the dealer. The locals were probably sitting there the whole day holding placards and banners and probably weren’t even noticed by the speeding cavalcade. This was the biggest showroom I had seen till date. At least 100 motorcycles on display. Each and every current BMW, Ducati and Triumph motorcycle was there. A short test ride later the mechanic suggested some repairs and also volunteered to stay beyond work hours to service the bike. 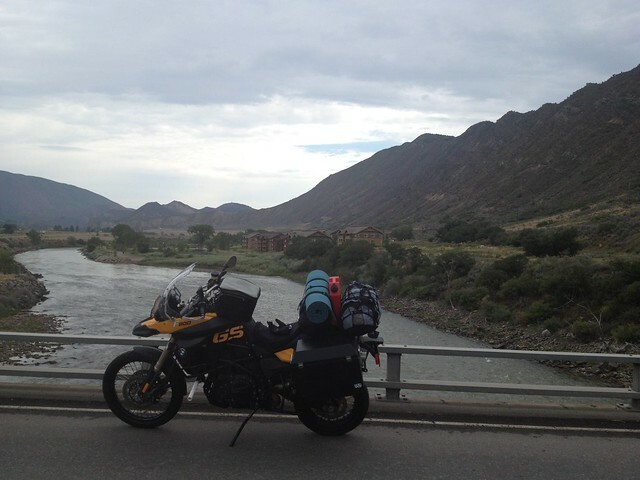 While the bike was getting some TLC I chatted up with another rider out on a week-long trip from Illinois. 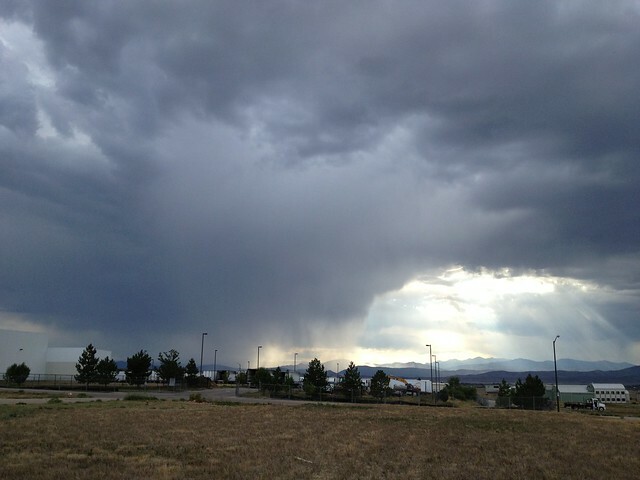 We exchanged stories while I watched the storm wash down the Rockies in the distance glad that I wasn’t under it. I reached Boulder as the light faded and checked into a motel near the Boulder University. I stepped out of the motel to get dinner at a local Indian restaurant (I had already had enough of American fastfood and was curious of Indian food quality outside of the Bay Area) and to wash my clothes at a laundromat frequented by the university students. This was my first time using a public laundromat. It was quite expensive considering I didn’t have too many clothes to wash. I could have probably bought some new clothes for the same price. As the closing hour neared the attendant slowly cleaned up and mopped the floor while contemporary music played on the speakers. I was the last one at the laundromat waiting for the dryer as the lights were slowly turned off one by one signaling an end to my day. 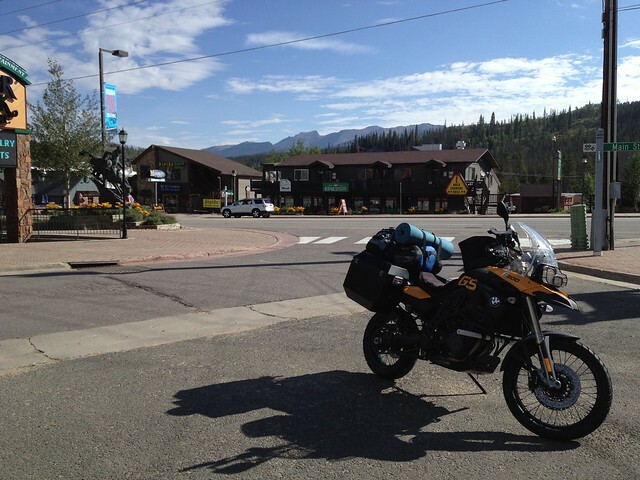 This marks the point in the journey where I crossed the continental divide. I shall use this geographical divide to break my post into two parts. The second part will document the rest of my journey from Boulder, Colorado to Atlantic shores in Connecticut and shall be out soon! Good stuff! Am almost tempted to drive out right now :). Eagerly awaiting part 2.
when is part 2 coming out? waiting for it!